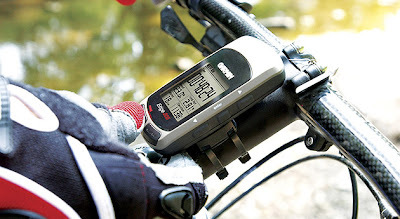 I'm not really looking to turn my blog into a product review site, but I cannot stay silent about the Garmin Edge 305. I needed a new bike computer and really wanted something with a heart rate monitor. I used to own a very expensive Polar heart rate/cycle computer but it is simply awful, so awful I may have to make a whole post to do it justice. At any rate, I was leery of buying something that had too many features. I just wanted something to tell me how fast I was going, how far I'd ridden, and maybe my heart rate. Virginia at Palo Alto Bicycles convinced me I really wanted the Garmin Edge 305. She was right: it rocks. I won't go into the feature list, that's what the web is for. Suffice it to say it is addictive. Once you've started using it, you need more, like a drug. If you forget the heart rate chest strap for a ride, or find your battery dead before a ride it makes you want to drive back home to get your strap, or wait an hour for your computer to charge. You want (dare I say need) it that bad. If you bike, you owe it to yourself to buy one of these. Here is a link to a recent ride posted on motionbased.com, and a link to the route on Google Maps. Labels: cycling GPS "product review"